The tenth episode of the fourth season of The Walking Dead, “Inmates”, starts off with a voice over of Beth writing into her journal before the prison fell. While we hear how she hopes to stay there forever, we see her and Daryl running from the catastrophe until they fall to the ground out of exhaustion. As morning nears, Beth tells Daryl that she wants to look for other survivors. 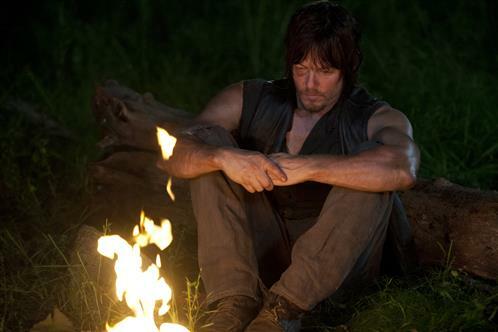 Daryl looks pretty dejected at this point, as if he’s given up hope completely. He doesn’t say much and Beth storms off with a knife but he gets up and follow, albeit slowly. Soon they come upon a set of tracks and on a nearby log, there are the remains of what appears to be a rabbit. They continue forward and stumble upon a pile of berries on the ground. There’s also fresh blood on the leaves, so whoever had been there left in a hurry. 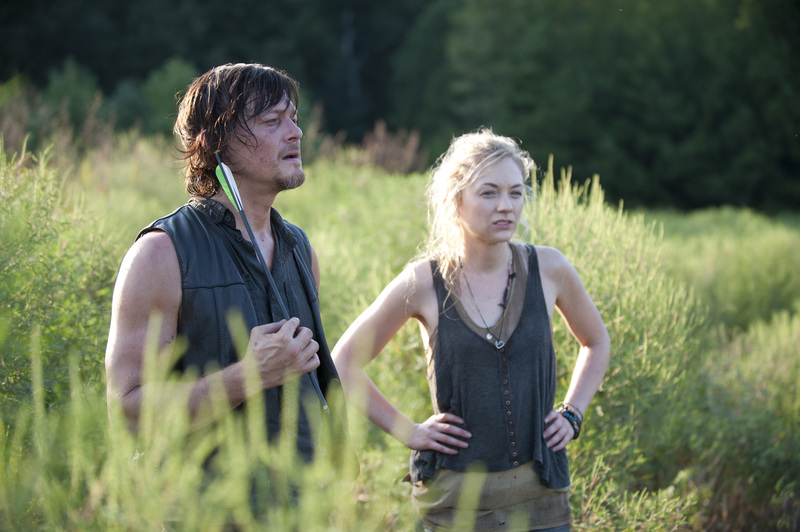 Beth remains hopeful that there’s survivors but Daryl reminds her that faith didn’t do anything to help her father. Ouch, Daryl! Eventually, they come across a group of walkers eating fresh bodies. After the walkers are killed, Beth breaks down and begins to cry. She had really hoped for a happier outcome. Later that night, she burns a page from her journal and comes to a resolution: We aren’t going to die. 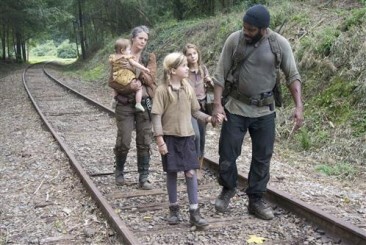 The next group of survivors we come across are Lizzie, Mika, and Tyreese carrying baby Judith! I’m going to pause for a minute while the half of the internet that cried in outrage can now let out a long sigh of relief. We see Tyreese and the children walking in the woods. Lizzie pauses to give Mika a knife to put into her belt. They stop to make camp for the night and Lizzie is sitting on a log (the same one from earlier with Daryl and Beth). She spots two baby rabbits nestled into the log and begins to butcher them. The others are unaware of what she is doing. She gives no expression, as if she’s simply cutting into the wood instead. The next morning, she is picking berries from the bushes while Tyreese is trying to console a crying Judith. He changes her diaper she continues to cry. Sounds come from the bushes and a startled Mika cuts Tyreese’s hand with her new knife and runs away. The noise turns out to be a flock of birds and they run after Mika. When they catch up to her, she apologizes for being afraid but Tyreese tells her she did the right thing. That she should always run away from walkers. They hear screams nearby so Tyreese leaves Judith with Lizzie and a gun with Mika before running to help. While he’s away, the baby continues to cry. The girls are afraid the sounds will draw in walkers so Lizzie places her hand over Judith’s mouth in an attempt to quieten her. What’s scary is she seems to be enjoying it; there’s a hint of a smile on her face. She becomes oblivious to the walkers nearing. In fact, she doesn’t even appear to hear Mika’s cries for help or the sound of her firing the gun. Meanwhile, Tyreese begins killing the walkers attacking the group by the tracks. Unfortunately, two of them had died from the attack and the third was bitten. He hears the gunshot and begins to turn but another walker attacks. 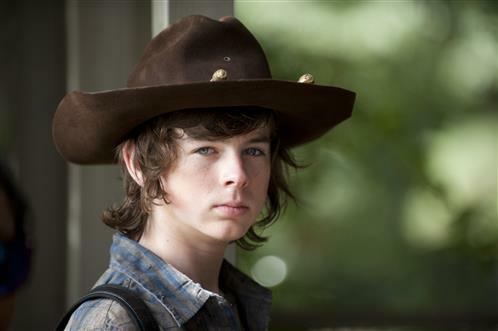 When the walkers are finally dispatched, he turns and is startled to see Carol there with Lizzie, Mika and Judith. He runs and gives her a hug, happy to see that someone else made it out. The lone survivor tells them of a Sanctuary that they can reach if they continue following the tracks. Shortly later, they come across a sign that says: Sanctuary for all. Community for all. Those who arrive survive. Maggie, Sasha and Bob have survived and are in a group with each other. Bob is still injured from the bullet wound he took to the shoulder but the bleeding has stopped. Sasha doesn’t believe anyone else got out but Bob reminds her that if they did, others could. Maggie had been looking for Beth and failed, so she wants to look for the bus that Glenn was on. Sasha protests as she’d prefer to spend their time looking for food and shelter. Again, Bob chimes in ever hopeful, preferring life to have more meaning than simply surviving. They come across the bus in the middle of the road. As they near it, they see it filled with walkers. Maggie comes up with a plan to let them out one by one so that she can dispose of them (and check among their faces for Glenn). However, this backfires and the walkers pile out. The trio dispose of them quickly and Maggie boards the bus to look for Glenn. A walker resembles him from behind but we do not get to see the face. She sits down and begins to cry. Glenn is in fact alive, but not on the bus. He awakens on what remains of the prison catwalk with a horde of walkers below. 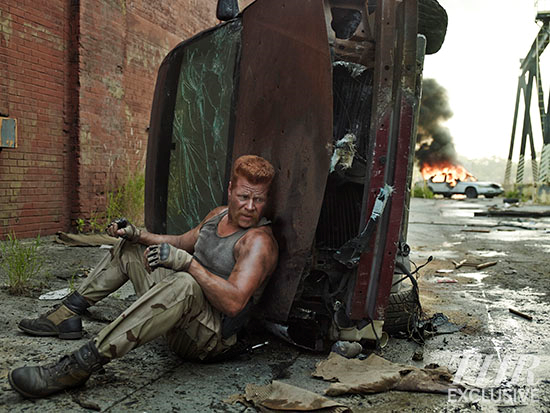 He calls out for Maggie and looks at what is left of the prison before going inside. He enters the cell he shared with Maggie and pulls out a swat uniform. He lays briefly on the bed until he sees a picture of her he had taken. He holds it and begins to cry. Determined to look for her, he begins packing weapons and supplies. He puts on the swat uniform and dives into the walkers, using the padded armor as protection. He sees Tara behind a fence and begins to leave her there but changes his mind and doubles back. He takes her gun away and checks the ammo. He sees that it’s full, meaning she didn’t attack the prison with the others. She tells him that she was part of this, and he replies that he knows but he needs her help. He returns her gun and distracts the walkers with a molotov cocktail so that the two of them can escape. Once on the road, Tara tells Glenn that she saw her sister but that biters had swarmed her. 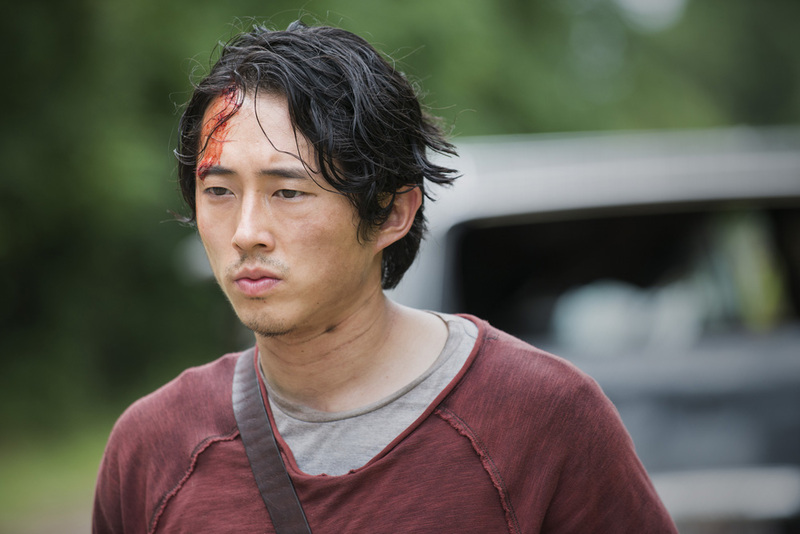 She tells him that Brian killed the old man, so why would Glenn want her help? He tells her that he doesn’t want it. He needs it to find his wife, Maggie. A group of walkers attack and they fight them off. 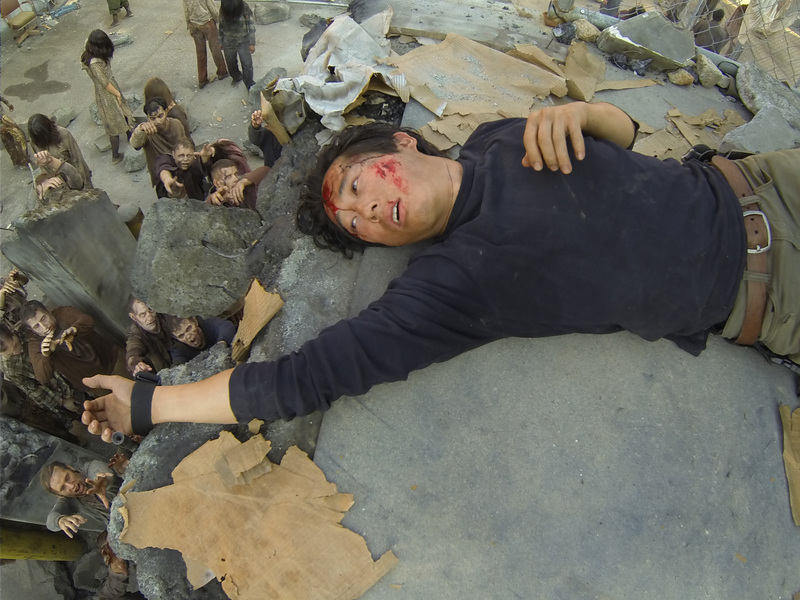 Still weak from the prison attack and his recent illness, Glenn collapses. A vehicle stops nearby doesn’t offer help. Tara is forced to kill the final walker alone. She curses at them for not helping and the episode ends with a much anticipated group finally make their appearance! What did you think of “Inmates?” Were you as happy for the appearance of Sgt. Abraham Ford, Rosita and Eugene as I was? What about Carol being back? That baby Judith is alive? Thank goodness Carol showed up in time to save the baby from possible asphyxiation! What do you think of Lizzie continuing down a dark and dangerous path? So much happened in this episode so I have to ask, what surprised you the most? Please let us know by discussing “Inmates” on our forums!